J.Crew Factory Chambray Dress - originally $79.50, on sale $47.50. As I mentioned in my J.Crew Factory post earlier this week, this dress is amazing. I wore it over the weekend in Michigan to go wine tasting, and it is so comfortable and flattering and cute. Definitely size up in this as the chest area runs small. LOFT Striped Top - originally $54.50, on sale $34.33. 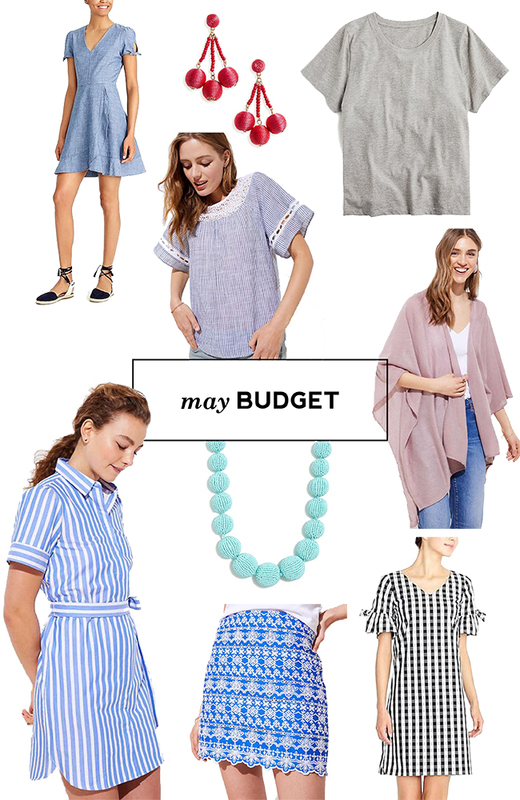 This top is all of my favorite things and so comfortable - definitely a great purchase for the summer! I may or may not be wearing it as I write this. J.Crew Factory Tee - $14.50. I've always loved J.Crew's tees for their amazing quality at a low price point, but their Studio Tee (my go-to) always feels a little more formal. This version is perfectly broken in and comfortable. I suggest going up a size or two in these as they typically shrink. LOFT Travel Wrap - originally $49.50, on sale $26.73. I shared this scarf/wrap here and really, it is basically the perfect summer layer. LOFT Striped Shirt Dress - originally $79.50, on sale $42.93. I also thought I would return this dress - I initially ordered it in a Tall and it was just too oversized and shapeless. But then I sized down and got the regular length, and with a different belt it's really cute. I'll definitely be choosing it for work and the weekends this summer. J.Crew Factory Beaded Necklace - originally $49.50, on sale $20.00. This was definitely an impulse buy on the way to the cash register, and I actually haven't gotten a chance to wear it yet. The color is just so pretty in person I couldn't resist! I can definitely see pairing it with a little white dress this summer. LOFT Embroidered Shift Skirt - originally $79.50, on sale $42.93. This skirt looks really short on the model so I was anticipating it being a weekend only piece, but in the tall it's actually long enough for me to wear to work! The embroidery is really pretty and I love the blue. J.Crew Factory Gingham Dress - originally $69.50, on sale $33.60. Is it really annoying when people describe inanimate objects as their spirit animals? Because this dress might just be my spirit animal. (not pictured) Coach Factory Pink Crossbody - originally $350, on sale $99.00, used giftcard $0. I don't buy a lot of designer bags, but when I do they had better be pink and on sale ;) You can see the bag here - isn't the color gorgeous? I basically couldn't not have it.